While going on a trip to Manali, I saw some travelers donning jackets with ‘Going to Leh’ on them. Then it hit me that I have been planning a trip to Ladakh, wait! A Ladakh bike tour since forever. Without taking much more time, I called my friends that we as so going to take on the roads of this rustic and rough destination. Much to my surprise, my friends agreed upon the idea and we started packing for our Ladakh bike trip from Manali. We thought of driving through Manali so that we could explore more places. Our Ladakh tour plan was scheduled from Delhi and lasted for 12 good days. So this was the day when we packed all the essentials and began our journey from Bengaluru to New Delhi. Throughout the flight, we were pumped about the adventure that we decided on. From Delhi, we were supposed to board a Volvo bus which would connect us to Manali. Even though our mind was wandering around the discomfort of traveling for long hours on the bus. However, most of the time went by in adoring the scenic backdrops, sleeping and stretching at the stopovers. We rode in Manali and the morning of the second day within in no time. As we de-boarded the bus, we saw a tour representative as cheerful to get us to the hotel as we were. The hotel seemed pretty decent being settled on a hilltop close to mall road. Without wasting much time, we completed the check-in formalities and went to get our bikes. The best thing that happened to us so far was that the rented bikes were in great condition. After that, we took a bike tour around the Solang Valley and Hidimba Temple. By the time it was evening, we thought of rushing back to the hotel for dinner. Followed by crashing in the room to get enough sleep for the day tomorrow. We were so excited for this day to finally begin. After having a filling breakfast, we checked out of the hotel and left for Ladakh via cab. We took a stopover at Rohtang Pass which is one of the best tourist places in Shimla to enjoy adventure sports. We spent almost was there and then a move to and next destination which was Jispa. By the time it was the evening we reached a destination which is a camping site 140 km away from Manali. To be honest it was one of our first camping experiences but something that which we cherished a lot. The night stay was another experience plus the bonfire and sleeping in the tents close to the river and the rustic setting. On day 4 we were supposed to leave for Leh and reach there before we miss the sunset. The journey was going to take us 9 hours to reach there and on the way, we took some time route to sightsee Deepak Tal and Suraj Tal. There is something really beautiful about a road trip that you get so lost in the views that you don’t even realize that you reach your destination. This is what happened with our trip from Jispa to Leh. By the time it was 6 we reached our destination that is Leh and check the night the hotel to relax. We started off with a filling breakfast as the day was going to be a long one. We planned on renting the bikes to visit the tourist places around Leh like the Hall of Fame which salutes the spirit of the Indian martyrs. Post that we crossed the highway of Ladakh from where we saw the meeting point of Zanskar and Indus. While going back to the hotel, we squeezed in some time to sightsee the Pathar Sahib Gurudwara and Magnetic Hill. The day was pretty hectic yet a great memory. 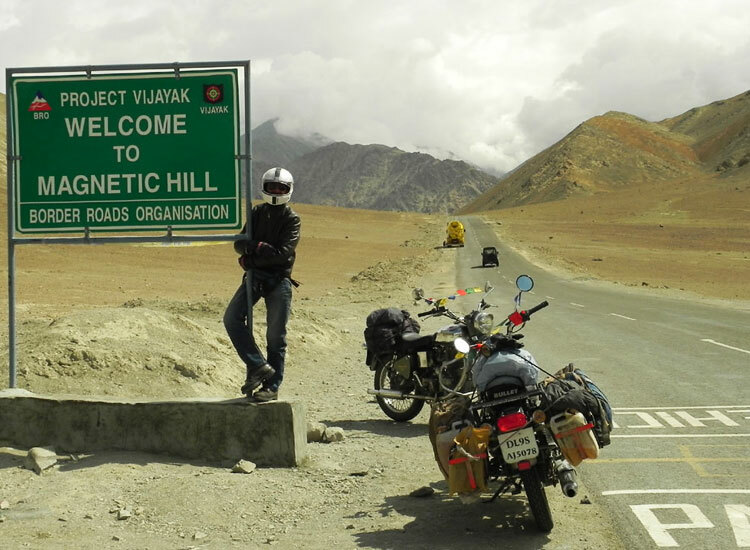 Finally the day we have been waiting for and maybe every adventure waits for, is a bike trip to Khardung La Pass, the highest motorable road in the world. This is the main reason our trip was planned around in Ladakh. After having breakfast, we check out of the hotel in Leh and prepared ourselves for the upcoming challenge. One thing that travelers should know about the roads that lead to Khardung La, is that they are not in a good condition. And hence you should be very careful while driving. The mountain pass is at an elevation of 5359 m due to which we experienced heavy head and breathing issues. We spent some time at the location and then decided to leave for Nubra Valley. In the afternoon we stopped by at Diskit for lunch. Resuming the journey, in a short while we reached Hundar, a tourist place famed for camels and sand dunes. After enjoying the camel ride, we got on our bikes and drove straight to the hotel in Hundar for night stay. For today we decided to explore more places in and around Nubra Valley. We kick started our bikes and went straight to the famous Panamik sulfur hot springs which are not too far from the Siachen Glacier. It is said that the hot springs have medicinal properties which can cure rheumatism and other diseases. We took a dip in the hot springs and then left for Hundar where our hotel was booked. Later we checked out of the hotel in Hundar and rode to Leh. We took the way from Khardung La Pass and just then our growling stomach asked for some delicious food. So we made a quick stop over to try the famous gravy chicken, thukpa and traditional dumplings. As our stomachs were satiated with the delectable dishes, we dusted our helmets and resumed the journey. By afternoon we reached Leh and returned the rented bikes. We stayed the night in Leh. Next on our bucket list was Pangong Tso which is also known as Pangong Lake. It is one of the popular tourist attractions of Ladakh. We definitely loved our journey to the lake, and upon arrival, we were left speechless. The whole area feels like a dream, with the lake sitting in the middle spreading its charm. At first, you will feel as if it’s a freshly done painting, with the lake in different shades of blue. As you rub your eyes, the real beauty of this lake will hit you. The hills in the background help the imagination and add a rustic touch. After spending some time along the lakeside, we made our way back to Leh. Exhausted by the activities of the day, we dozed off as the next day was going to more frenzy. Today’s plan was to start early and take a cab to Kargil. A number of dry fruit farms followed us on the way, and we stopped at one of them to get some of the fresh fruits. The city of Kargil welcomed us in the afternoon and we moved to the hotel for night stay. The next morning we began our journey to Srinagar, the city which is popular for its heart winning beauty. Every corner exudes peace and untold stories. Our first stop for the day was Kargil War Memorial settled close to Tiger Hill. It is here that the famous battle was fought between India and Pakistan. If you visit the memorial someday, you will be filled with pride after knowing what all our soldiers did to safeguard the country. Continuing the journey, we saw the rough terrains of Ladakh and the stunning valleys of Kashmir. We chose the route through Dzozola Pass finally reaching Srinagar. This was the last day of exploring the serene realms of Srinagar. So we thought of keeping it simple and booked a boathouse in Dal Lake popularly known as ‘Srinagar’s Jewel’. This was another experience that we loved the most followed by thoughts of extending our stay. We didn’t even realize that when our bike trip to Ladakh came to an end, but we really loved every moment spent in Ladakh. We made it a point to reach the airport early so that we don’t get stuck in the way and miss our flight. To sum up, our whole Ladakh adventure trip somehow managed to dodge the bad experiences. 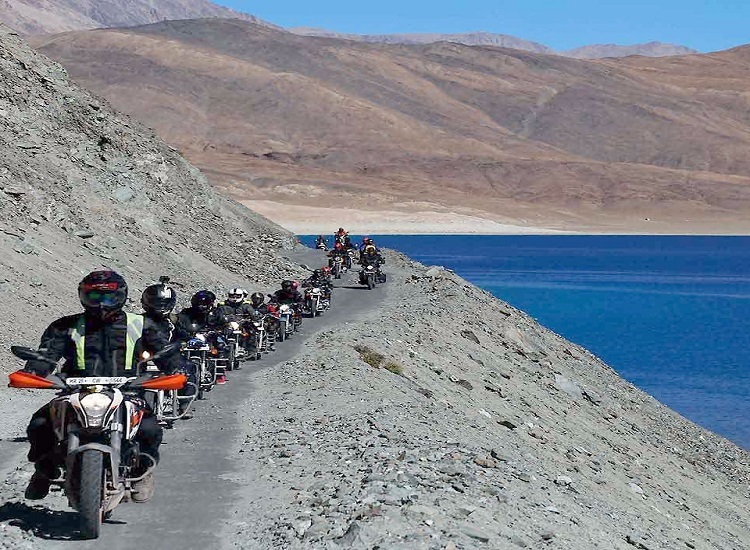 And became a bike tour to Ladakh which will be our favorite memory. It is often said that ‘Take every chance you get in life because some things only happen once’. I and my friends totally believe in this after this trip. 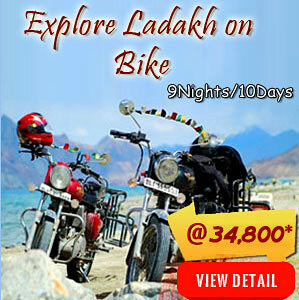 We would totally recommend taking a trip to Ladakh by bike as that is the best way to embrace this destination.